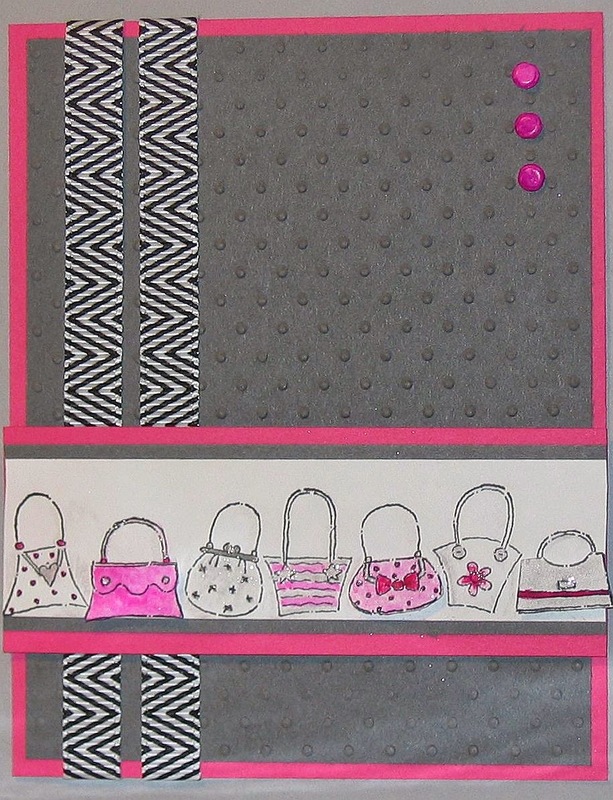 My title refers to a retired Stampin Up set from which I pulled this stamp with a collection of purses. Since the stamp set is over ten years it qualifies as retro rubber. 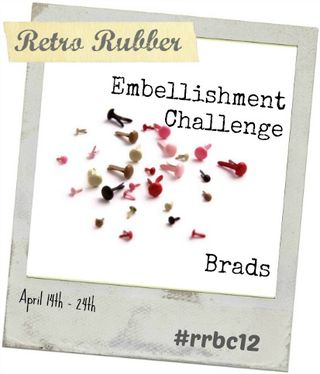 I hope you check out the Retro Rubber challenge 12 on their website where the theme is "Hey Brad". How long has it been since you have used your brad collection? This card was inspired by the Card Concept Challenge # 33. The pink and grey color combination and all the dots and chevrons jumped out at me. I didn't realize that it was a baby's room right away (dah! ), I just thought the owner would be a stylish lady with a shoe and purse collection. My style is 'clean and layered'. I pulled the dots in on the purses and in the dotted background. The ribbon, a gift from a friend, added the chevrons, and a couple layers added some stripes . I had to use a sharpie on my brads to make them hot pink. 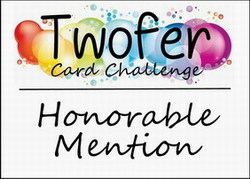 I toyed with using them to affix a sentiment, but I don't know how I am going to use the card yet. There is a bit of Wink of Stella on the purses. In fact, three of the purses are popped up because I spilled a bit of wink on one of them. Its what we call a 'happy accident' because they look better popped up. Can anyone tell me why I can't get these two pictures to sit side by side unless I put words in between them? Aargh. Check out the links above to find your own inspiration. Looks great, Dora, all finished and "braded"! Hello Dora: I absolutely love the sweet line of pretty purses in your card and how you took the colors in the Card Concept and combine them with the Retro Rubber Challenge to make this very fabulous card. The brads look totally hot pink, great idea to color them with your Sharpies. Your bags look so cheerfull and I love your design and the striped ribbon! Thanks for your lovely comment! I'll look a bit more around here...and a happy Spring to you too! I love your girly card! The graphics and textures really work well together and the color combination is hot. Thanks for including Retro Rubber in your stamping fun this week! 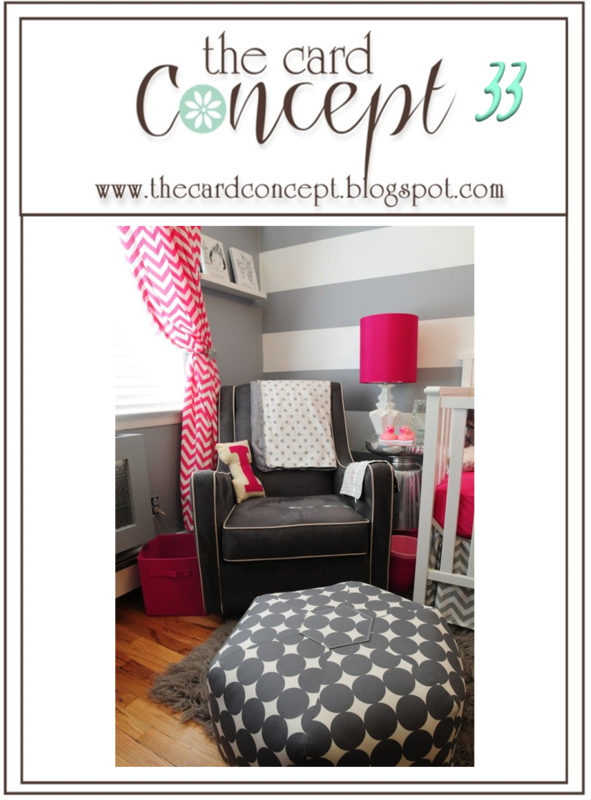 Oh, how I love hot pink and black or gray together! The purses are wonderful and oh-so-stylish! I love how you colored your brads with a sharpie (glad you had one!). Thank you for playing along with Retro Rubber this week. Such a fun card! Thanks for doing the challenge! Very sweet card, the brads add a nice balance. 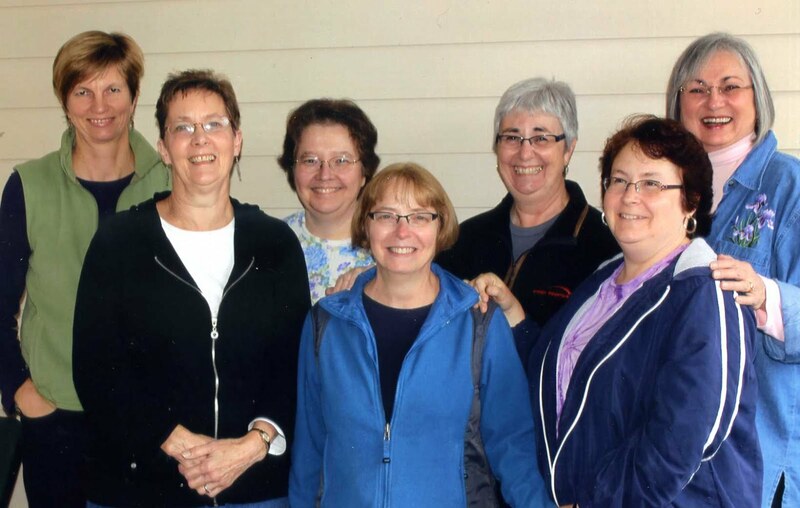 Thank you for joining us at RRBC. You had me at the purses! And then the colors! I forgot about the brads! Beautiful! Thank you for joining us at Retro Rubber!